Arches Brewing Winter’s Night will be available for the first time in cans this weekend. This dark German-style lager dates back centuries. From Arches: A traditional lager that is best characterized by its striking dark color and a strong malt flavor. It is complemented by an elusive, light mouthfeel which offers a clean, crisp finish. 12-ounce cans of Arches Brewing Winter’s Night will be available when the brewery opens on February 8th. Waves and waves of arctic air pummeling the United States with cold air. The meteorologists call this the Polar Vortex. It was only a matter of time before a beer named after the balls cold from surfaced. Two Brothers Brewing (SDFE) is releasing a dunkel lager dubbed Polar Vortex in 22oz bombers on February 23rd. You might think, why not an imperial stout? if you get snowed in for a while, you can drink longer. Duclaw Brewing Co’s 31 has returned. The brewery takes a Munich style dunkel lager and adds fall spices like cinnamon and nutmeg. Draft and bottle offering where Duclaw is sold. Availability: 12oz bottles. Draft. Fall seasonal. Ed note: updated to reflect bottle offering too. Troegs Brewing (Hershey, PA) adds Scratch #91 “Dunkel Lager” to the series this month. The recipe comes from TrÃ¶egs brewer Jeff Campbell. A traditional Bavarian dark lager brewed with Chocolate and Munich malts and German noble hops, Scratch #91 is smooth, rich and complex, but comes without the heaviness of many other dark beer styles. DuClaw Brewing Co re-releases 31 this week. A spicy Munich dunkel.A crisp, medium bodied Spiced Munich Dunkel. This German-style copper-colored lager tricks you with its smooth, malty taste and moderate 5.7% abv, then treats your palate with a spicy finish of cinnamon and nutmeg for a brew that on a scale of 1 to 10 is easily a 31. Port Brewing makes a beer with hot rocks. Yes, hot rocks. 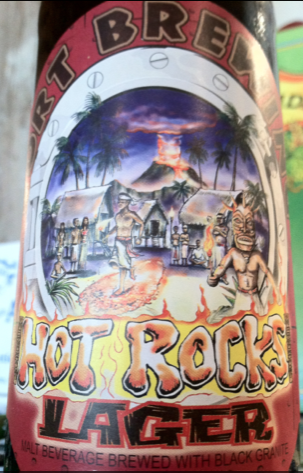 “Hot Rocks Lager” is brewed by adding glowing hot granite to the brew kettle. In doing so, the rocks cause a “super boil,” caramelizing the sugars. The result is smokey toffee & caramel. According to Port, these wouldn’t be prevalent in a normal boil. Hot Rocks is a spring seasonal, first released in 2009. Taste Expectations (Per Port): The flavor is a robust dark lager with layer upon layer of caramel sweetness with just enough hopiness and malt to prevent it from being cloying. The finish is sweet with toffee and cocoa notes and a faint dryness. Availability: 220z bombers. Early Spring seasonal.